I often talk about the many interesting and wonderful things I find on my kitchen counter when I wake up in the morning. Valentine’s Day is no exception. Ralph and I had gone on an excursion yesterday because he wanted me to pick out a box of candy. I was going for something small, about the size of a saucer. He would have none of that. Nearly a pound of truffles. What shall I do with them?! 😉 I love the drawing he did for the front of the card. Take note that the envelope is cut and the drawing is set into it. 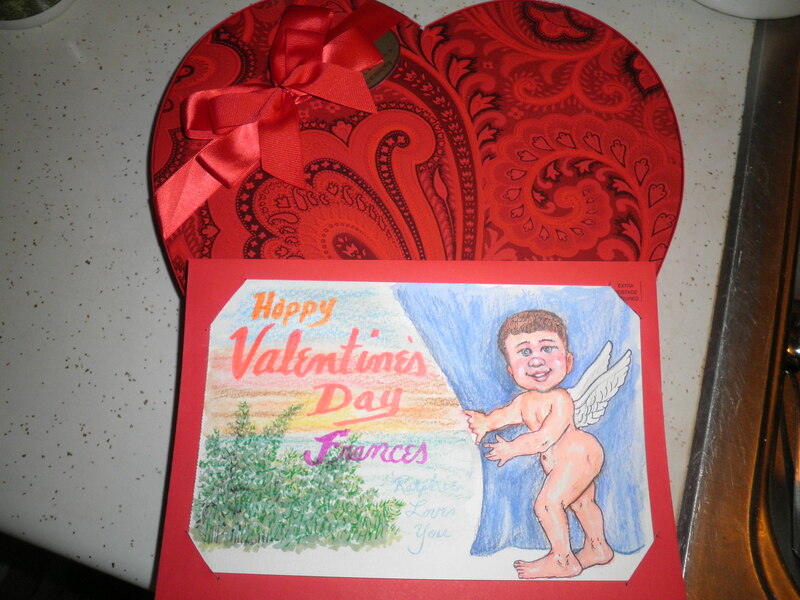 That’s because the envelope to my card was red and Ralph doesn’t like to draw on the dark color if he doesn’t have to. So he added it! The inside was the best though. I don’t know how many of you are familiar with Animaniacs. It was a wonderful, hysterical animated series done by Stephen Spielberg back in the 90’s. It’s always been one of our favorites. If you’re not familiar with the show, you should become familiar with it so that you can appreciate how amazingly good this is. He is hysterical with things like this. He’s crazy and I Love Him! Happy Thursday! Happy Valentine’s Day! Ralph is the best, always has been, always will be! And you ain’t so bad yourself! Have a wonderful Valentines Day! Thanks, Ele! Happy Valentine’s Day! happy hearts day, fran!!! love LOVE ralph’s treats for you, both the truffles and the artwork!! i hope you both have a wonderful valentine’s day! xoxo! Thanks so much, Cathy! I know how lucky I am. Happy Valentine’s Day!! I loved the Animaniacs! So did my kids! There is a rather strong likeness and Ralph did a great job capturing it! You’re a lucky woman! Happy Valentine’s Day to you both! Thanks, Donna! Great to hear from you on here. Blogging is so much fun. Glad you like me as Dot! I think it’s adorable. Happy Valentine’s day to you and Christine! What a good man. 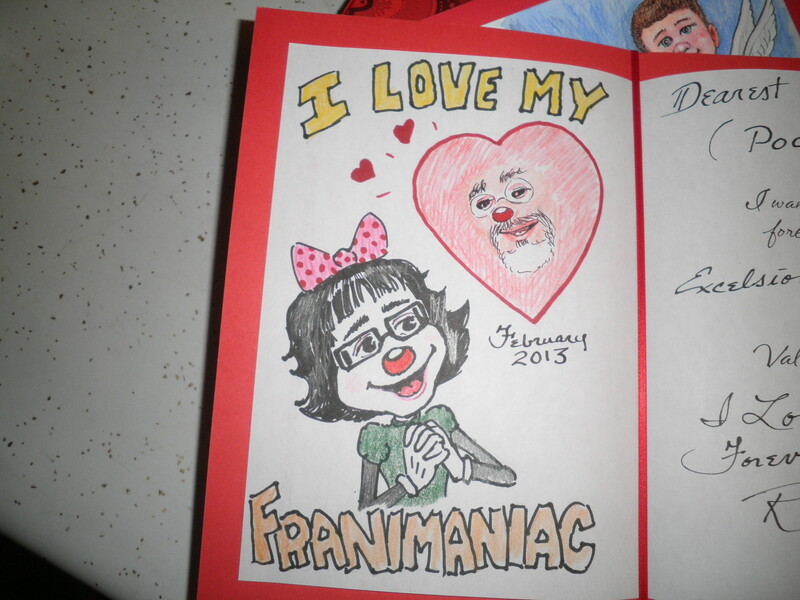 Happy Valentine’s Day Fran! I’m so lucky, Meghan…he is the best! Happy Valentine’s Day to you too! Thank you so much, Sharon. Sounds like you have a creative hubby, too. How sweet. Hope you had a lovely Valentine’s Day! Allie, how did I know you would love Animaniacs?! One of the cable channels here is showing them, in fact they’re having a President’s day marathon. Sadly we have a funeral to go to. Hope you had a wonderful Valentine’s Day! This is super cute! I guess you can keep him around for another year…lol. Enjoy the rest of your Valentine’s Day! Thanks, Dawn! I thought it was adorable. I guess I’m stuck with him after all these years. 😉 Have a great day! You are one lucky girl! I love the Animaniacs and Ralph did a super job capturing Dot as you…he’s a clever, talented guy! My honey sent me a box of chocolate covered strawberries from Shari’s Berries. I received them at work and of course everyone wanted to put them in my car for me…or so they said! I didn’t have the heart to check the calories…hey, it’s Valentine’s Day…it doesn’t count, right? I guess Katie Kaboom would have been appropriate! Ralph and I love Animaniacs and I was so excited when I saw the drawing. Thanks, Katy.